Please find below a list of the major new features, improvements and bug fixes in AODocs version 39. 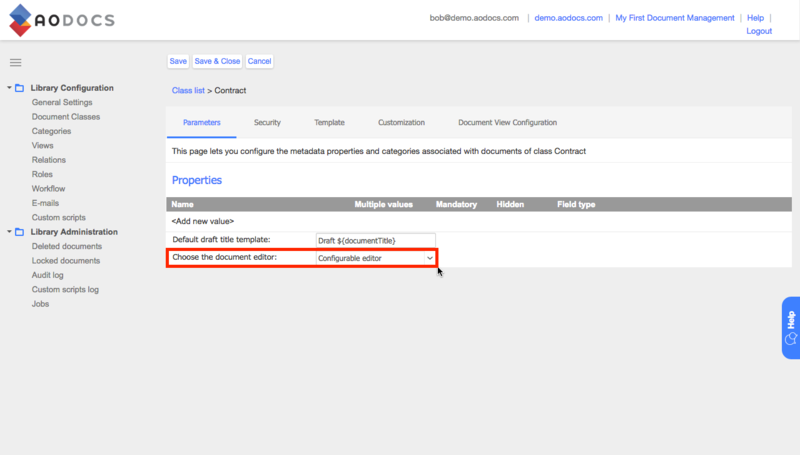 It is now possible to configure the workflow states to automatically check-out or check-in a document. In addition, we improved the check-in/check-out behavior: now each time you check-out a document, a draft version of it is created. The modifications made on the draft version are not visible to the other users until the draft version is checked in. What is the check-out / check-in? As a contributor, it is now possible to delete a folder along with the documents in it. This only applies to the items that you have been given access to edit. For instance, if you have read-only access on one of the documents in the folder you want to delete, the only documents that will be sent to the trash are the ones on which you have edit access. Thus the read-only documents, and the folders they are located in, will remain. To create a new document class or a new library, one needs to choose an option through the document editor. In this new AODocs version, the default document editor has become the “Configurable editor”. In the previous AODocs version it was named the “New Beta” editor. Since AODocs release 38, this configurable editor allows administrators to manage the page widths of documents and the order of different document sections, such as “properties” and “attachments”. Note: Administrators can still switch to the legacy editor from the document class settings. Existing document classes won’t automatically switch to the Configurable Editor. 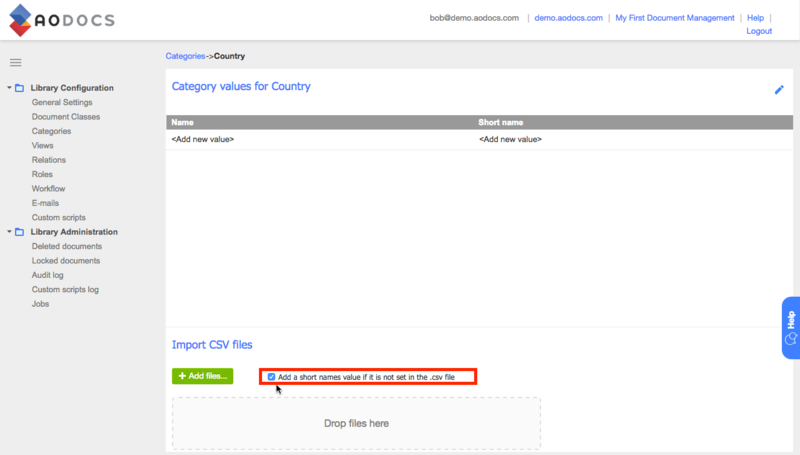 You can now define the short names for category values imported via a CSV file. There is also an option to create and define short names automatically if they are not defined in the CSV. 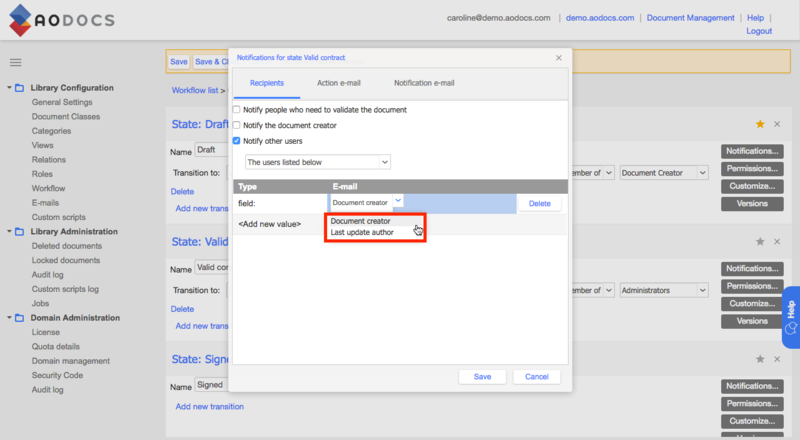 Administrators can now use any person fields of the document class to define the recipients of notification emails. At the request of customers, AODocs support agents can connect to the domains of customers to diagnose issues. When using this impersonation feature, AODocs will now ask the support agents to input their reasons for accessing the customer’s domain in a textbox that will be recorded in the customer’s audit log. 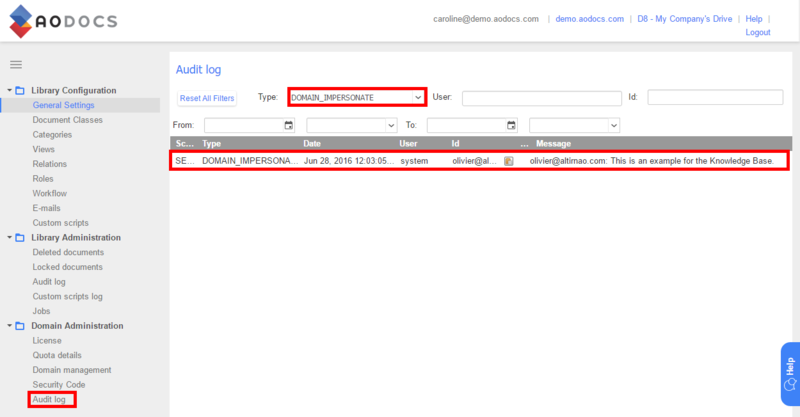 All AODocs super administrators will be able to monitor the access of support agents through their AODocs audit log. In Team Folders and Secured Folders, the option “publish the document” is no longer displayed for non-native documents such as images, PDF files or Microsoft Office files. If you drag & drop a Team Folder in another Team Folder, the dropped library will now move back to your My Drive. When a library is copied, workflow settings or “notification email” are now copied automatically. With the configurable editor, if no value is defined for a dynamic category, the user can set a category value when editing a document. Automatic workflow transitions are no longer triggered for deleted documents. Users won’t receive workflow notifications for deleted documents. The picker to attach a file from Drive to a document now respects the folder structure of the user’s My Drive. When editing a document in AODocs, the tooltip which gives the title of the attachment is now clearly displayed on the attachment tab. In Team Folders and Secured Folders, when a user uploads an attachment, the title of the file attached is now updated in the AODocs document page as well as in the attachment tab. Carriage return can now be used for properties with the type “text”. It is now possible to attach a Google Drive file to an AODocs document even if the file was previously attached to a permanently deleted AODocs document. External users now use licenses when they edit a file in Drive. If the document class is set to have read-only documents when the documents are not checked out then the documents are not anymore checked out during the document creation. Users have to check out the newly created documents in order to edit them. The issue should be fixed by the time AODocs has its release 42. Communicate on the new options to create draft version of a document.